Using a prefab garage kit is a great way to save time and (sometimes) money when adding new parking or storage space. Many prefabricated garage kits are geared towards the do-it-yourselfer with limited construction experience or skills. Assembly of these is just a matter of following instructions using common tools. A prefabricated garage kit can save you money even if you are hiring someone to build it for you, because the labor costs are kept to a minimum. The most difficult decision in the whole process is usually what type of kit to purchase. There are a number of different types and sizes available, and each type of prefab garage kit has its own advantages and disadvantages. 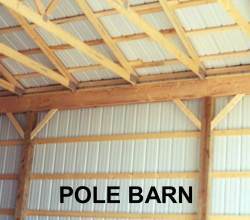 - Pole barn packages: A pole barn uses wooden posts or poles for the support structure. The siding is then attached to horizontal slats on the outside of the posts. Most often they use metal siding and have a metal roof, although some kits can be ordered with almost any type of siding or roof that you want. Pole barn packages do not require a floor, because the posts can be set into holes in the ground that are then filled with concrete. A concrete floor can usually be added later if you wish. Often the least expensive option for the do it yourselfer, these require more labor to assemble than some other types of building kits. See my page on Pole Barn Kits for more info. - Panelized Prefab Garage Kit: These come with the walls already assembled into panels, and are one of the easiest types to build. These kits are usually completely made of wood, and go up much more quickly than a stick-built building. Some panelized kits use structural Insulated Panels (SIPs), which have a rigid foam layer sandwiched between two sheets of OSB to form each panel. This is a neat design, with the panels fitting together kind of like Lego blocks. The foam acts as insulation, and you already have an interior wall that is ready for paint. - Steel Tube Buildings: These have a framework that is made from sections of light gauge steel tubing. Sometimes called slip-fit frames, the ends of the tubes fit inside each other and are then fastened with screws. Most come with steel siding, but there are kits available that will allow you to use wood or other types of siding. 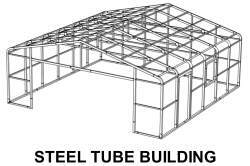 Steel tube buildings are very easy to construct, but have a lot of individual components. Take a look at the Steel Garage Kit page for more details. - Rigid frame prefab steel garage: This is the most robust type of prefab garage kit out there, with a structure that is made of heavy, solid steel I-beams. Rigid frame steel buildings usually require a crane for construction and most need a heavier-duty foundation for the columns to rest on. A rigid frame steel building is best suited for a larger structure or commercial application. See the Steel Garage Buildings page for more information. - Open Web Steel Truss Buildings: These are similar to the rigid frame prefab steel garage, but use open webbed steel columns and rafters. Open web steel truss buildings offer a lot of the advantages of rigid frame steel buildings, and the smaller ones do not need a heavy foundation or a crane for assembly like a rigid frame building. These are generally less expensive than the rigid frame type because they do not contain nearly as much steel as the solid I-beam type. Some are very similar to a pole barn design, and they just use open web steel beams instead of wooden posts and roof trusses. - Steel Arch Buildings: These have round roofs or rounded roof peaks and no eaves, and do not have any interior structure. The steel arches are the structure. 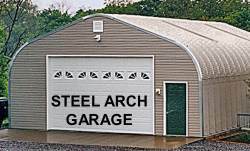 Steel arch buildings are one of the easier types of prefabricated garage kits to assemble, but they may be frowned on or even prohibited in some residential neighborhoods. Visit my Steel Arch Building page for more info. - Modular garage kits: These require the least assembly of all. The pre-built garage is delivered in sections that are already assembled, and then it is just a matter of placing the sections side by side and attaching them. The downsides are that modular garage kits are somewhat limited in size, and some require interior supports that can get in the way. For more information, visit Modular Garages. With all these different types of building kits available, there is at least one type that will suit almost any need. Just make sure you know exactly what is included in the kits you are pricing. Some prefab garage kit prices don't include doors or windows; some of the wood kits don't include roofing materials. To learn more about the pros and cons of these types of buildings, go to Prefabricated Garage Kits. Check out the menu of our Related Pages for information on other building types. As long as you do your research and know what you are getting, a prefab garage kit can be a great option for getting a garage built quickly.